I’ve written several times about patrolling Wikipedia for vandalism. It a great way for new editors to get practice with simple editing tasks. It is also can be a way for skeptics to demonstrate our impartiality. It’s important to remember that vandalism on Wikipedia, just as in the real world, is often done in sprees. This is important, because it can help you avoid overlooking some instances that might be right under your nose. The edit here (at bottom) was by an anonymous user – you can see it is logged to the IP address 50.107.128.28. Looking at the contents of the edit, I found it was a made-up species name (“Gigantopithecus sapiens helena”) for the cryptid apes that were reported at Ape Canyon. But this name is completely fictional, it’s never been assigned by actual scientists. So removing it is uncontroversial. I removed it. Now I could have just patted myself on the back and moved on, but remember this edit was logged to an IP address – i.e. an anonymous user. What if this was part of a vandalism spree? Cryptozoology fans will probably recognize all three of those article names. Sure enough, this anonymous user had in fact edited three different articles about Bigfoot-like cryptids. Sure enough, clicking those “hist” links revealed the other two edits were exactly the same sort of thing – insertions of fake species names for other varieties of Bigfoot. None of these edits had any basis in reality, and none belong in an encyclopedia. Just a couple clicks later, I had removed all three. But if I hadn’t thought to look at the editing history for that IP address, I would have only been able to fix one third of the underlying problem! So next time you’re removing a bogus Wikipedia edit, be it vandalism or nonsense, don’t stop there. Take a quick look at the editing history for the responsible source – be it a regular user or an IP address. You may have found the tip of an iceberg. This entry was posted in How To, Wikipedia and tagged vandalism, wikipedia on April 2, 2015 by Tim Farley. I defended Dr. Oz on Wikipedia – and you should too. Dr. Oz at ServiceNation 2008 by David Berkowitz licensed CC BY 2.0 via Wikipedia. In my how-to series on becoming a Wikipedia editor, I highly recommend spending time patrolling for vandalism using a watch list. It’s good practice with the software, and it helps you build up a positive editing history. Vandalism on Wikipedia is unfortunately constant – a side effect of their radically open editing policy. This policy allows anyone to anonymously edit most articles, logged only by IP address. Because skeptical topics are often controversial (in some circles at least), they can spark strong responses, including sometimes vandalism. As a result, if you’re looking for vandalism to fix, skeptic-relevant articles often provide plenty of ammunition. Indeed, over my career as a Wikipedia editor I’ve removed the word “idiot” from Australian science communicator Dr. Karl’s biography, undone claims that Indian skeptic Prabir Ghosh is a “fake doctor” and excised antisemitic slurs from the biography of Professor Michael Barkun. But I don’t reserve my vandalism patrols just for people I consider allies. I’ve also removed the word “douchebag” from the biography of Bart Sibrel (famed for being hit by Buzz Aldrin). I’ve cut out some rude edits regarding L.Ron Hubbard. I’ve even removed some creative writing on Larry King’s biography that verges into science fiction. Because of his current fame, Dr. Oz has been a repeated target for attacks. I’ve removed an accusation that he is a bad surgeon, undone some veiled anti-Muslim sentiment from his article and removed weasel words about his training. I’ve even erased the phrase “quack doctor” from his biography! Why Defend The Bad Guys? Some skeptics might wonder, why bother with this? Folks like Dr. Oz are a detriment to society, don’t they deserve to take some lumps occasionally? Maybe so, but Wikipedia is absolutely the wrong venue for this. Skeptics already get wrongly accused of many crimes on Wikipedia. This occurs in part because Wikipedia’s rules and administration are admittedly pro-science. So when we simply enforce the rules, we are perceived as having a pro-skeptic bias. As a result, we need to do everything we can to provide evidence that we are not in fact biased. Applying the rules (such as the rules on vandalism to biographies) equally to friend and foe is a great way to accomplish this. Removing vandalism is easy, once you know how. And it demonstrates our lack of bias clearly and unambiguously. It is also a good way to help maintain Wikipedia’s excellent record for quickly removing vandalism. Bottom line: skeptics should not tolerate name-calling and bias on Wikipedia, whether it is for us or against us. And the editing history will back us up when we point this out. This entry was posted in Skeptic Activism, Wikipedia and tagged Bart Sibrel, Dr. Oz, Guerrilla Skepticism, vandalism, wikipedia on March 23, 2015 by Tim Farley. As you may recall, last May I documented Deepak Chopra’s habit of trolling well-known skeptics and atheists on Twitter. He repeatedly taunts them, tweets links at them and makes snide or insulting remarks. Among the things that make the behavior so blatant is Chopra includes Daniel Dennett and Jerry Coyne in his taunts. Dennett very rarely converses with anyone on Twitter, and never with Chopra. Coyne has specifically stated on his blog that he never converses on Twitter at all – he just uses it to as an alternate blog feed. Chopra must know this. One can only conclude his one-sided conversations are an elaborate show for his own followers. But some people do respond to Chopra, including Brian Cox as seen in the clip. (Their previous Twitter exchanges have been documented by Jerry Coyne on more than one occasion). Incidentally, the angry tweet Cox mentions in the clip appears to have been deleted by Chopra. He does that a bit too, in my earlier post I document one tweet to me that he deleted. Tracking Chopra’s deleted tweets might be an interesting skeptic project. @AdamRutherford @DeepakChopra @TeamCoco I have no idea, but I'm having it made into wallpaper for my under-stairs bathroom. This entry was posted in Bad Behavior, Social Media and tagged Brian Cox, Conan, Deepak Chopra, troll, Twitter on March 2, 2015 by Tim Farley. In 2012, Google introduced a feature to their search engine they call Knowledge Graph. The company has compiled millions of facts into a database, and offers them up on the right-hand side of search engine result pages in a handy box. The graph is also the source of many of the answers you get in the voice response versions of Google, such as in Google’s smartphone apps. The answers come from many sources including the CIA World Factbook and Wikipedia. At the time this was launched, I wrote how skeptic efforts editing Wikipedia were paying off in a new way, exposing the public to skeptics and skeptical topics in these knowledge graph boxes. We worked with a team of medical doctors (led by our own Dr. Kapil Parakh, M.D., MPH, Ph.D.) to carefully compile, curate, and review this information. All of the gathered facts represent real-life clinical knowledge from these doctors and high-quality medical sources across the web, and the information has been checked by medical doctors at Google and the Mayo Clinic for accuracy. This has a great potential to combat the infamous “Dr. Google” syndrome. This is a popular term for the tendency of incorrect or even pseudoscientific information, by virtue of its prominence in the search engine, misleading the public. Who can forget the 2007 sound byte from the Oprah Winfrey Show, when Jenny McCarthy stated, “The University of Google is where I got my degree from“? How many others are out there learning incorrect info from bogus websites pushed up into the Google results via SEO techniques? Many different studies have shown that search engine users rarely move beyond the first page of results. Thus the placement of these knowledge graph results prominently on the first page of results might have a good effect. It remains to be seen whether these knowledge graph boxes will help draw attention from potentially dangerous organic search results. You can recognize the new additions because they typically appear in boxes offering separate tabs on general info, symptoms and treatments. They also always contain advice to consult a medical doctor for advice. (See diagram). I searched several medical topics and was pleased that I could not find any in which alternative medicine had been included. 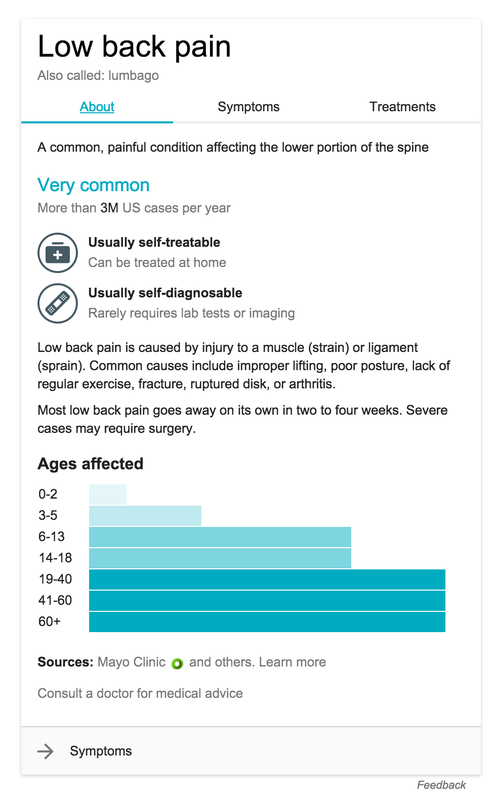 For instance, the lower back pain topic shown here does not offer acupuncture or chiropractic as an option. This is a good sign, but skeptics should keep an eye on this feature. I’m sure the alternative medicine community will eventually pressure Google to include their nonsense. If you do notice spurious alternative medical information appearing in one of these results, you can click the word Feedback at lower right. The box will highlight and show a prompt to click on the error. You can then select which piece of information is incorrect – you will be prompted to explain why you think it is wrong. This entry was posted in Web and tagged alternative medicine, Google, knowledge graph on February 26, 2015 by Tim Farley.